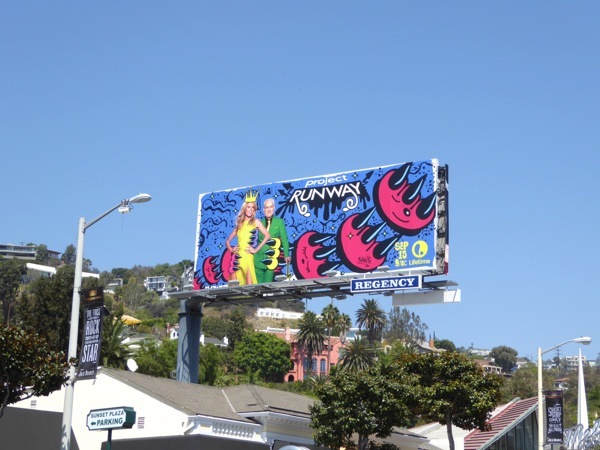 When Daily Billboard first glimpsed this season's ad creative for Project Runway we thought the billboard had been vandalised with graffiti as it's such an unorthodox visual for the reality fashion competition. But as the show is in its fifteenth season this youthful billboard, looking like it's been overrun with clawed Pokémon, is just what the doctor ordered to help the Lifetime series stand out in the crowded Fall TV season city skyline. Even though Heidi Klum and Tim Gunn may not have taken home the Emmy for Outstanding Reality TV Show Host this year (although they have won the award in the past), they're still queen and king of reality TV competitions in our opinion and always know how to 'Make it work'. The reality royalty return to judge and mentor sixteen new fashion design hopefuls, once again competing for the chance to show their collections at New York Fashion Week and win the grand prize to help kickstart their own fashion line. 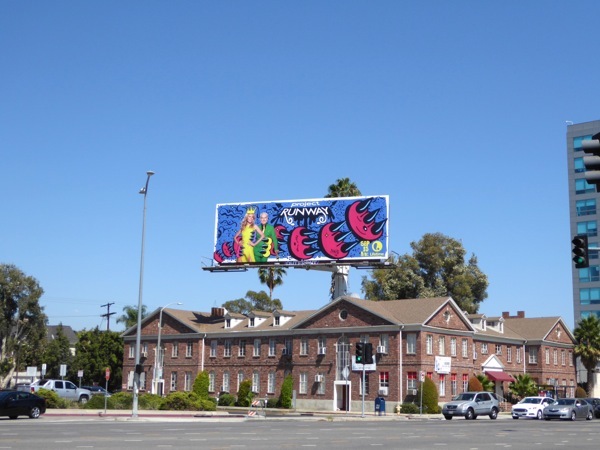 These vibrant billboards were first spied above West Hollywood's Sunset Plaza on September 7, then a few days later along San Vicente Boulevard on September 10, 2016. 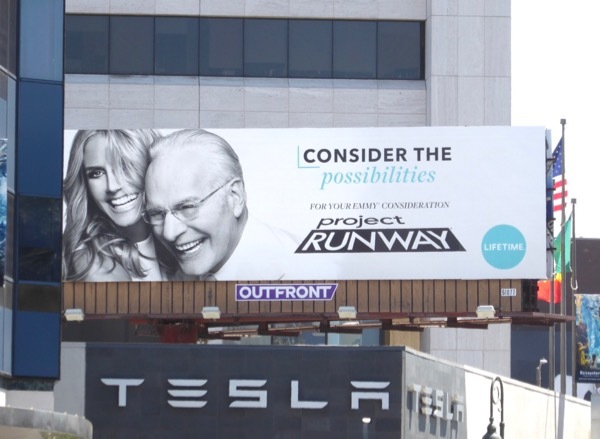 If you love this fan-favourite show as much as we do, be sure to check out all the previous season promo billboards for Project Runway, from glittering scissors to scantily-clad ad creatives featuring Heidi Klum herself. As the German supermodel is notorious for saying, "In fashion one day you're in and the next you're out", so tune in tonight to see who will be the first contestant to be eliminated for their garments not being runway ready. UPDATED: Here's also an Emmy consideration billboard for the show's fifteen season, snapped along Santa Monica Boulevard near Sepulveda Boulevard on July 4, 2017.